Note: The following excerpts from the chapter “The Extension of the Croton System” by Kevin Bone (pp. 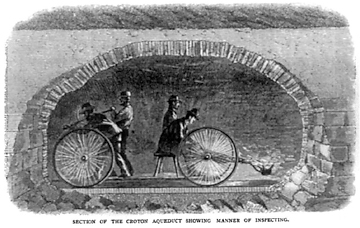 60ff, in “Water-Works: The Architecture and Engineering of the New York City Water Supply,” Kevin Bone, ed., 2006, Irwin S. Chanin School of Architecture of The Cooper Union and The Monacelli Press, New York), convey a sense of the difficulties New York City faced when the original (“Old”) Croton Aqueduct was its sole water supply. “ . . . The aqueduct itself, much of it located above grade on artificial berms, was exposed to erosion, differential settlement, and to the freeze/thaw cycles of the harsh New York winters. Soon after completion  it became evident that the aqueduct would need constant upkeep. The collapse of retaining walls, the settlement of earth supports, and cracking in the brickwork because of thermal expansion and contraction all resulted in significant leakage. Large quantities of water were escaping from the aqueduct before reaching the thirsty city. The first two improvements to come on line were the second receiving reservoir and, also in 1862, addition of a 90.5-inch pipe to the High Bridge — the 1848 bridge that carried Croton water from the mainland to Manhattan, originally in two, relatively small 36-inch pipes. In the ensuing years a new aqueduct and some dozen dams and reservoirs enlarged the Croton system, today a National Historic Civil Engineering Landmark. *E. Wegmann, “The Water Supply of the City of New York,” 1896, Wiley, p. 48.